Theatre Night - "Vanya and Sonia and Masha and Spike"
This special presentation of "Vanya and Sonia and Masha and Spike" is a fundraiser for the Richmond Hill Garden & Horticultural Society, made possible by The Curtain Club. Tickets are $15 apiece, a $7 savings as compared to future performances, and are available at our September 5th General Meeting, or by clicking he "Register" button to the left. 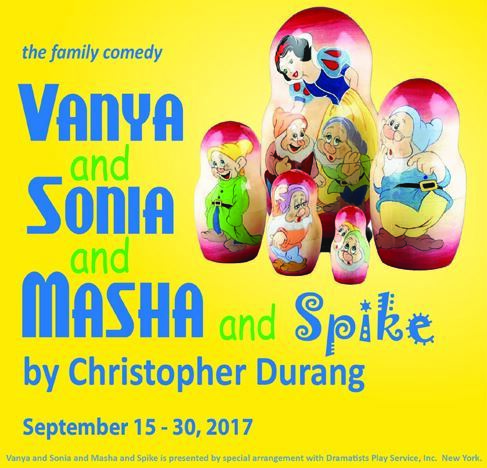 About "Vanya and Sonia and Masha and Spike"
Vanya and his adopted sister Sonia live a quiet life in the Pennsylvania farmhouse where they grew up, but their peace is disturbed when their movie star sister Masha returns with her twenty something boy toy, Spike. This witty, heartfelt look at sibling rivalry and family values will rock the house with laughter. For more information about The Curtain Club, click here.